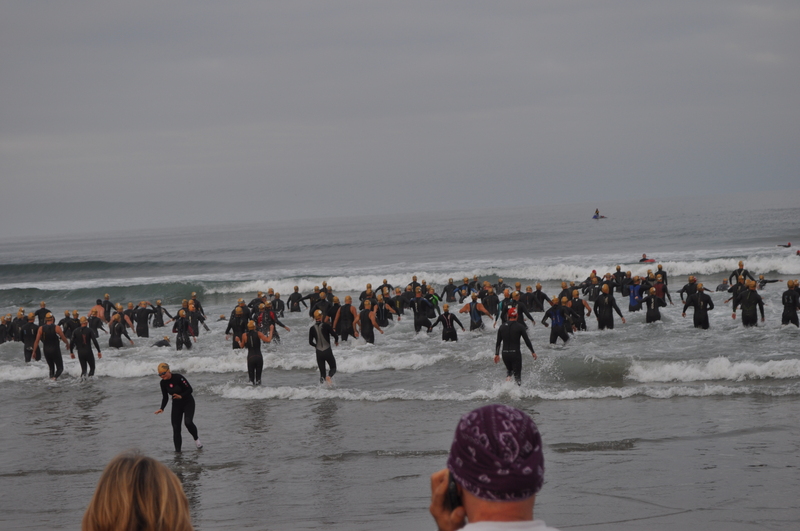 9/11, Navy SEALs, surf, sand and a great race! 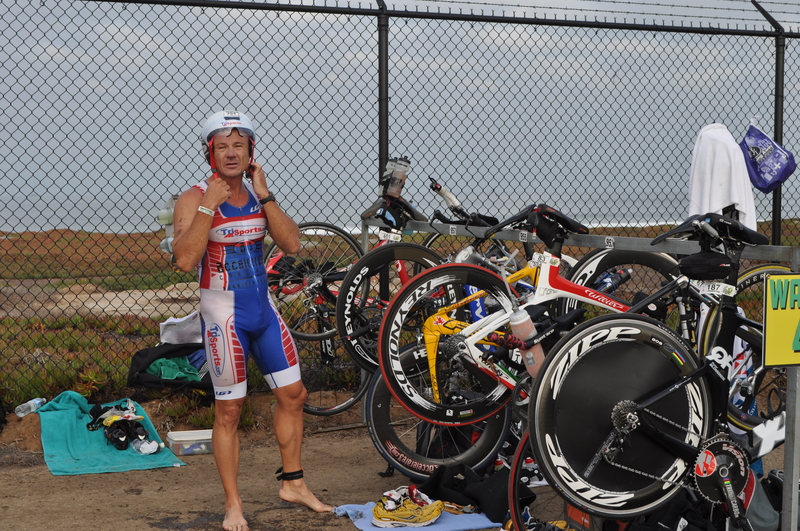 On Sunday 9/11 I took part in the 33rd Superfrog triathlon. 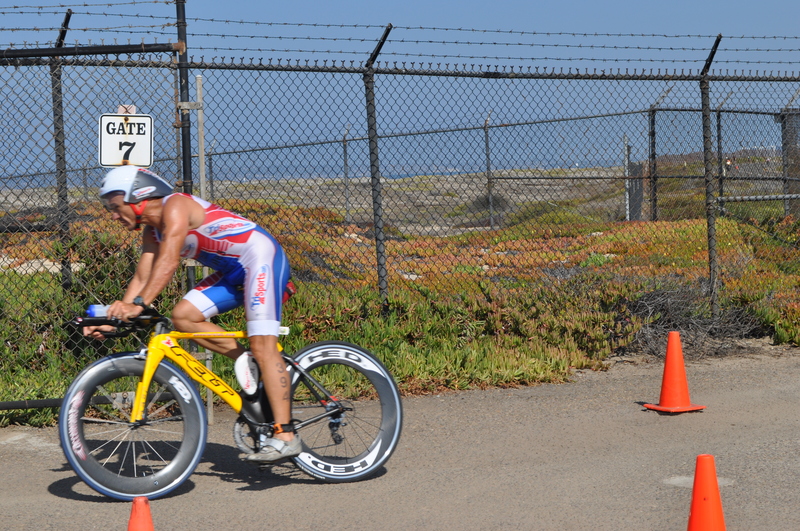 The race is the 1/2 Ironman distance…1.2 mile swim, 56 mile bike and 13.1 mile run. 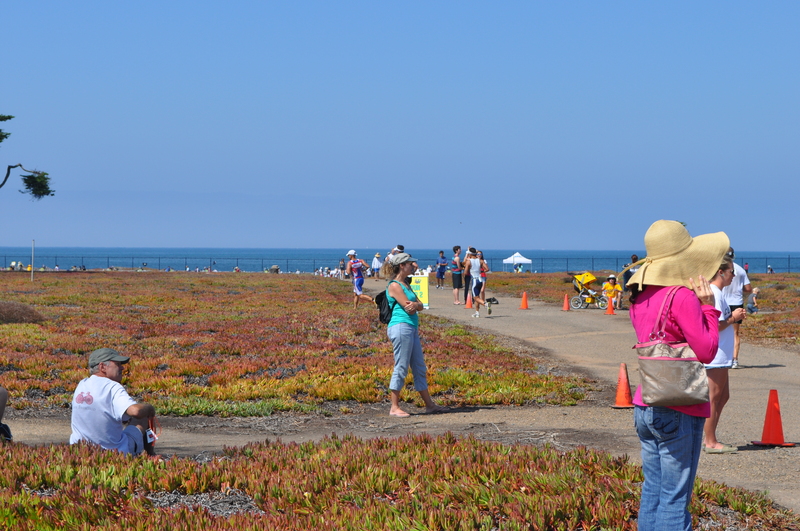 It is held on Coronado Island, California. Coronado is probably best known as the home of the Navy’s Special Operations Training Center aka BUDs where sailors become SEALs. The race is put on by former SEAL Moki Martin, as it has been since the beginning, and he does a great job. The course changed slightly this year with a new start, finish, and transition area. However, the basic course remained the same. 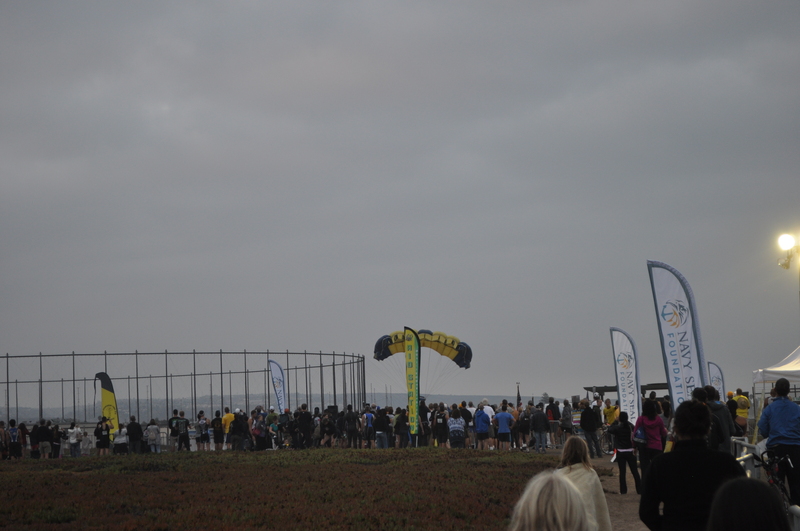 On Saturday I arrived in San Diego and proceeded to packet pick up. Packet pick up went quick with no lines to deal with. I had a nice meal and then checked in to my hotel. After putting the final touches on my gear it was lights out for the night. I slept well, waking only a few times. Race morning I awoke early. I ate a bagel, a banana and drank a bottle of Gatorade. I loaded my gear into the car the made the trip to the race venue. Racks were assigned by wave (which were by agegroup). 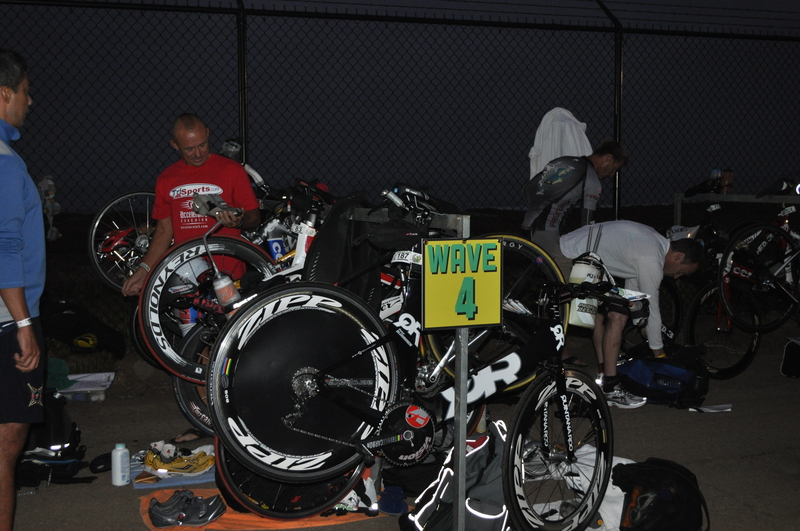 I was in wave 4 which put me in the middle of transition. The transition was a single, long row of bike racks. I found my rack area, racked my bike, and set up my gear. I then had time to talk to a few of the competitors racked near me. 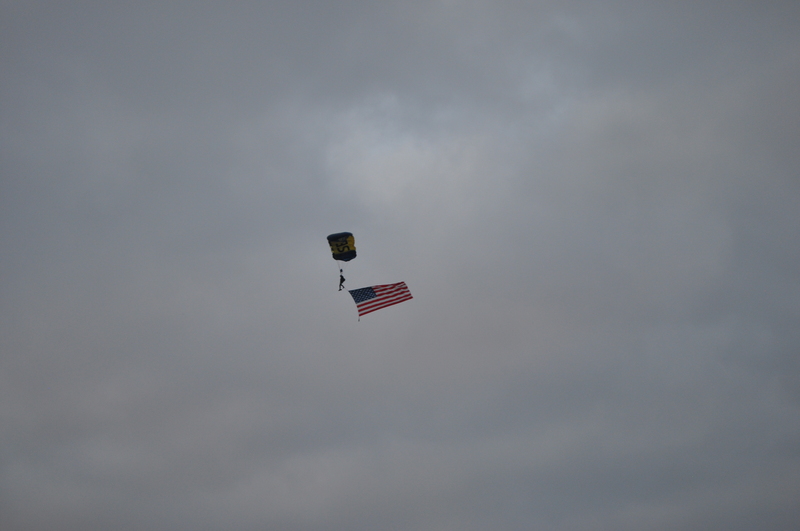 Being the 10th anniversary of 9/11 the Navy SEALs parachuted in to the transition area. 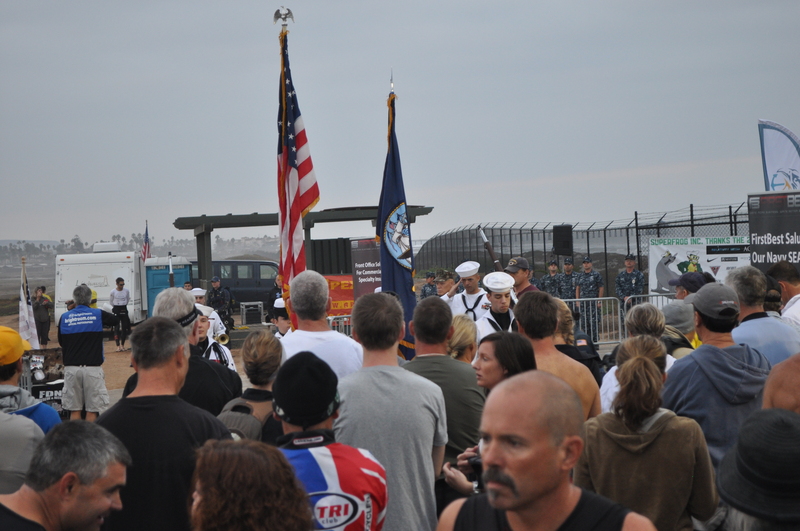 After the aerial show the SEAL color guard presented the colors for the National Anthem. A moment of silence followed as a lone bag piper played Taps. With the ocean waves crashing in the background, it was a very somber moment. 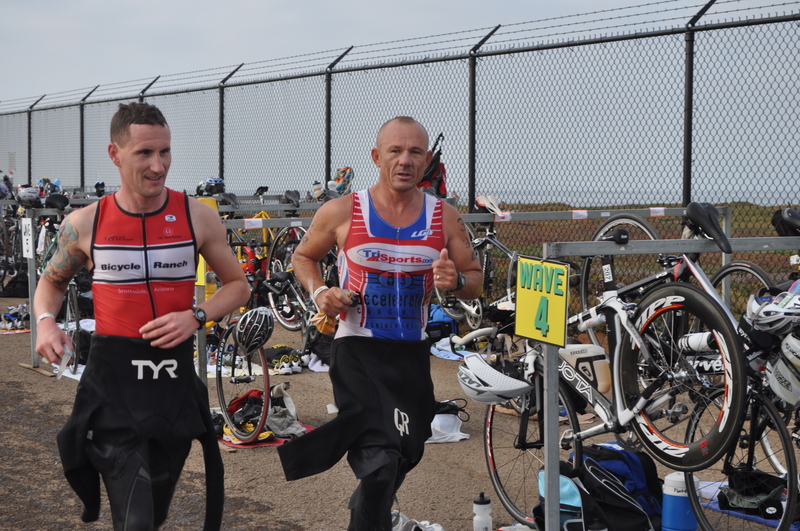 I then put on my wetsuit and headed down to the beach to prepare for the start. It was now game time! I got in the water for a few minutes to adjust to the tempature while the first 3 waves started. The pro’s started first with 5 minutes seperating the following waves. The swim is 2 laps with a short run on the beach in between them. The swim conditions were the best they have been in the 4 years I have done this race. Water temp was in the mid 60’s, the surf was 3-4 foot and there was no currents. With the start being on the beach, I positioned myself near the front. men 40-44 and 45-49 ready to rock! And GO! We were off to battle the surf. I headed into the surf diving under the waves. Once the water was deep enough I began to swim and continued to dive under the waves. With two large orange buoys on the way out sighting was easy. I swam a straight line to the first buoy and was feeling good. The surf smoothed out just past the first buoy. I then began catching the slower people who had started in the wave before me 5 minutes prior. I sighted and swam a straight line to buoy number 2 and made the right turn to parallel the beach. Again my sighting was spot on and I swam straight to the third buoy making the right turn towards the beach. They had a lifeguard truck, with its emergency lights on, parked on the beach to sight off of. As I hit the next buoy I began to watch for waves in hopes of catching a free ride into the beach. After a few small waves passed I spotted a larger one churning up. I swam hard and caught it. I was passing people with ease as I body surfed towards shore. But then the wave came crashing down on me pushing me deep under the water. After being thrown around and twisted under the water I collected my bearings and told myself to remain calm as I held my breath and made my way to the surface. What seemed like minutes in reality was just seconds. As I reached the surface I took in a big breath of air, saw the beach and swam into the shallow water before dolphining in to the shore. I made the run down the beach and was ready for round 2. The second lap was less eventful. 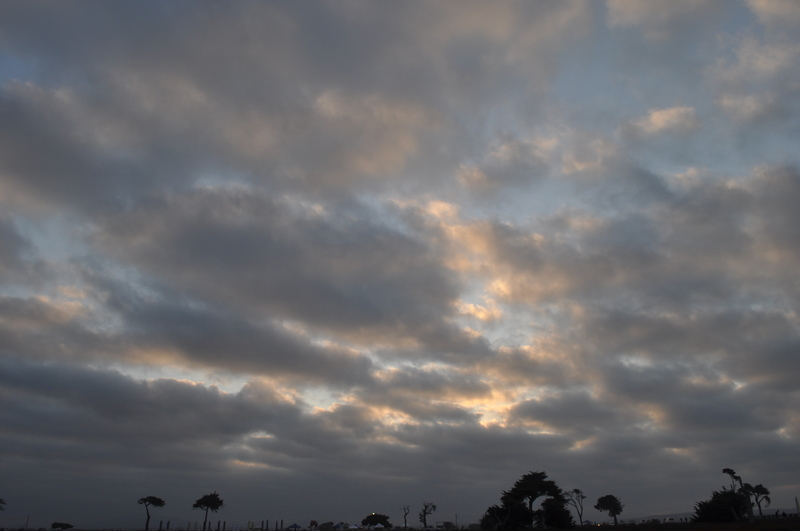 I got through the surf and settled into a good pace, and again swam a straight line along the buoys. I hit the beach and ran up the soft sand into transition. I then removed my bike from the rack and made the long run through transition to the mount bike line. Every step in my bare feet was a painful reminder that the pavement was rough, very rough! Ouch! The first mile and a half is on rough cement with several turns. I then hit Highway 75. Flat and fast. 4 out and backs on closed highway. I quickly got up to speed. You start by heading south, make a 180 degree turn, head north, make a 180 degree turn and repeat x4. My nutrition plan was simple. I started the bike with 6 scoops of Carbo-Pro mxwd with Gatorade in my aero frame mount bottle…nothing else. There was an aid station at the south turn around. First loop I grabbed a water, drank a bit and got rid of it at the end of the station. Second loop I took a bottle of energy drink (Infinit was on course) and kept that one the rest of the bike on my between the aero bars bottle cage. I drank my Carbo-Pro mix on the north end of each loop. I maintained an even pace throughout the bike. I stayed on my aero bars and was passing people throughout. After the first loop it is impossible to know what lap the passee’s are on so I just kept my pace…hard but comfortable. Watching my lap times I knew I was on pace for a 2:20. The wind was kicking up a little off of the ocean as usual. At the north turn on my 3rd lap I was passed by the race leaded, Lars Finanger who was racing pro and started in the first wave 15 minutes before me. He was flying! At the end of my 4th lap I made the turn in towards the transition and navigated the rough road once again. 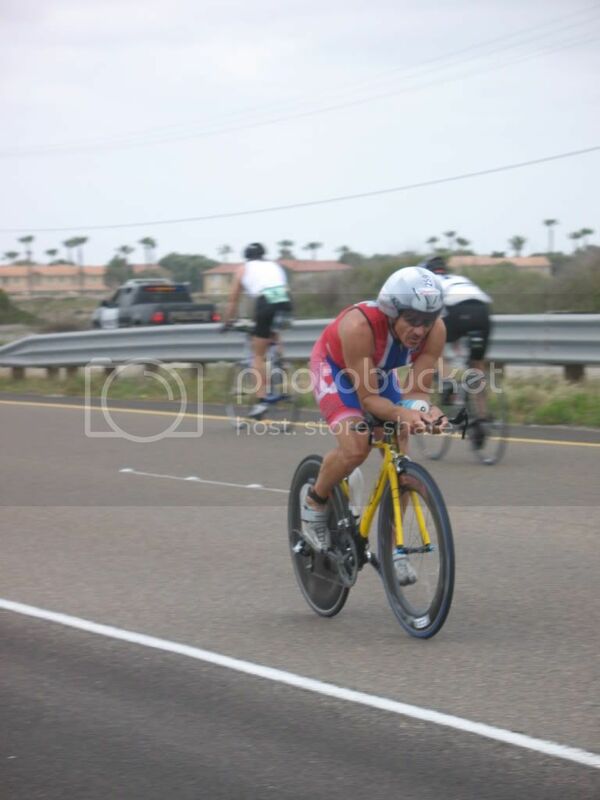 Feet out of the shoes, kicked the leg over the top tube and as I hit the dismount line I hit the ground running. I was quickly reminded of the rough pavement…Ouch! I racked my bike, removed my helmet, running shoes on, grabbed my hat, sunglasses and race number belt and was off on the run. I put on the grabbed items as I ran out of transition. The run consists of 2 loops. Half of each loop is in the sand along the beach. Out of transition you immediately make a right turn into the soft sand and make your way down to the beach. Nutrition plan was a GU energy gel every 3rd aid station, water at all the others with salt tablets as needed. 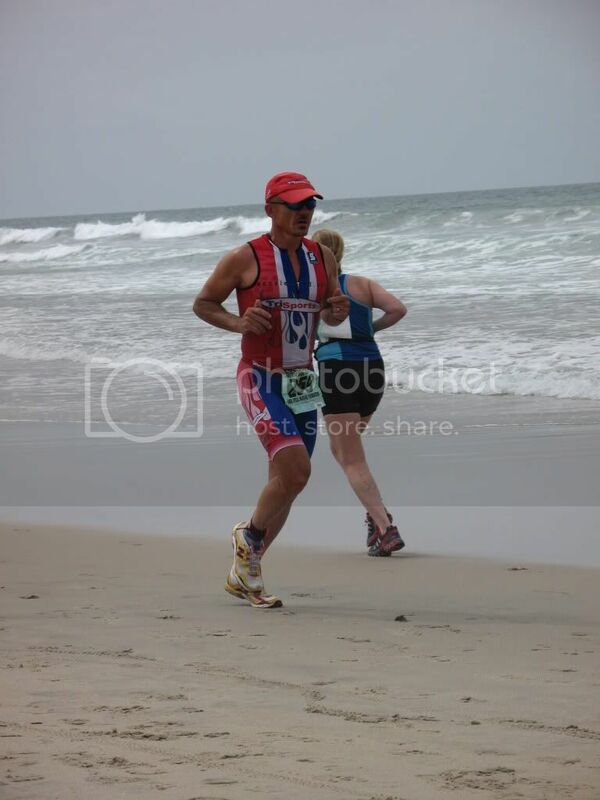 I kept a slightly easier pace in the sand heading north to the 1st turn around. We then ran south to the second turn around. I continued my slightly easy pace through the sand. Once back to the start point it was back through the soft sand to the pavement. As I exited the sand I was once again passed by Lars followed shortly after by Jozsef Major who at that point made the pass and took the overall lead in the race. Once on pavement I picked up the pace slightly. On the pavement we turned south and made our way into the “Gorilla cage”, a normally tightly secured area where the Navy SEALs conduct there advance training. It was very cool to be able to run through this area that is normally reserved for the few elite forces that survive BUDs training. The southerly section of the run was windless and hot. We ran by the entrance gate, turned east and then north along hwy75. Looped around and between the finish and transition and then it was time for round 2. Soft sand and beach. A quick glance at my watch showed a 51 minute 1st loop. I briefly spoke to a competitor in a Navy kit as he passed me. Through our brief conversation I learned that he was the Commander of BUDs. On the sand again I again backed off just a bit. Made the turn on the north end and was feeling good so I made the decision to pick up the pace. I made good time to the turn around and continued my pace. Up through the soft sand and into the heat again. Several people who passed me early in the run started to slowly come back to me and I made the passes fast so they wouldn’t try to go with me. With about a 1/2 mile to go I began to feel the pains of my effort. Small cramps were starting to raise their evil heads. I just told myself to hold it together just a little longer. I push as hard as I could to the finish and hit the line exhausted. 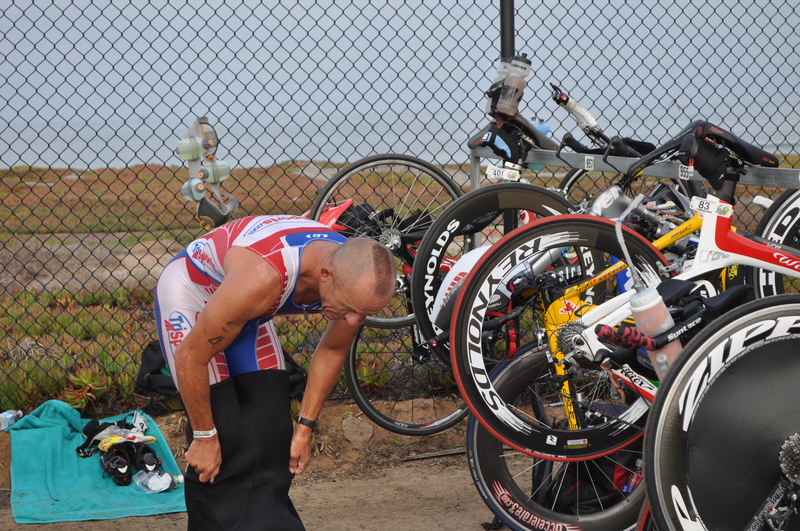 My bike and run moved me from 121st after the swim to 27th overall at the finish. 2nd in the 45-49 agegroup and 16th amateur. 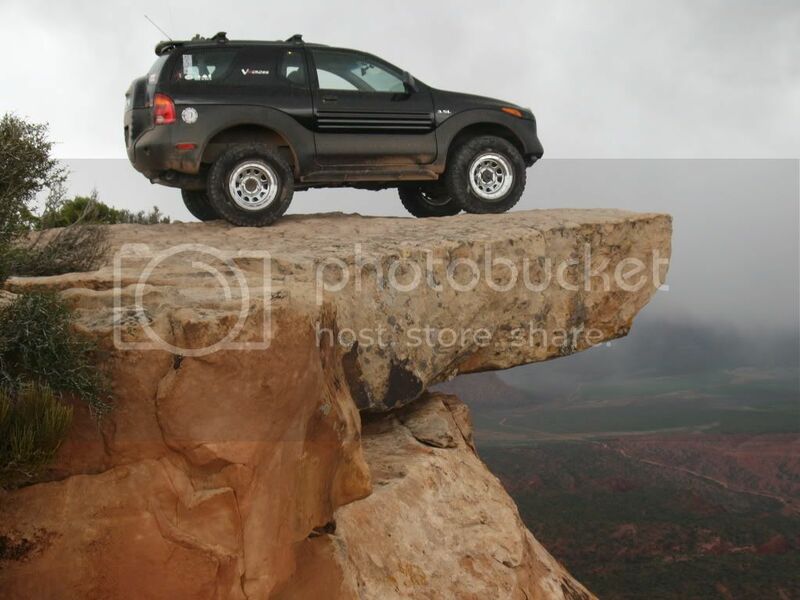 This entry was posted on September 15, 2011 by Billy O. It was filed under Triathlon . October 14, 2011 – SUPERFROG XXXIII presented by “Act of Valor” on September 11, 2011 was a huge success for competitors and charity. Race Director Mitchell Hall has announced that Navy SEAL Foundation will receive a major donation as a result of the event. This year’s SUPERFROG featured a performance by the Navy Leap Frogs Parachute Team and a piece of metal from one of the fallen World Trade Center buildings was displayed. 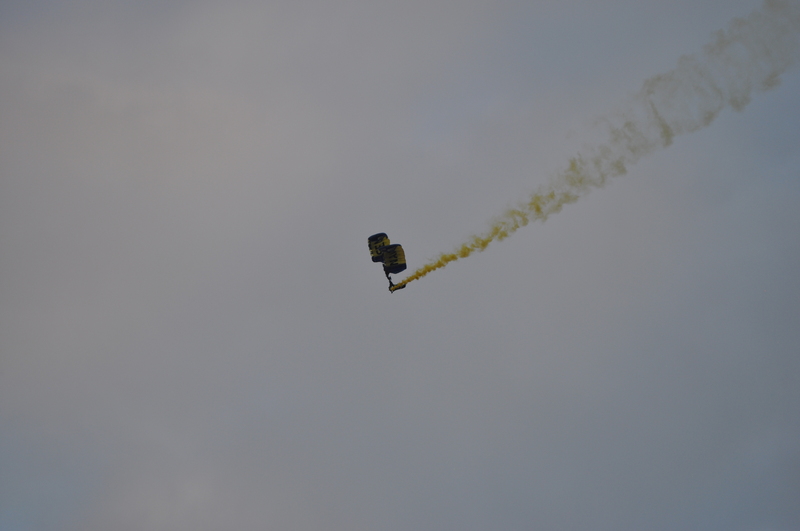 Hall said the SUPERFROG organization will donate $42,000 to the Navy SEAL Foundation as a result of this year’s event. 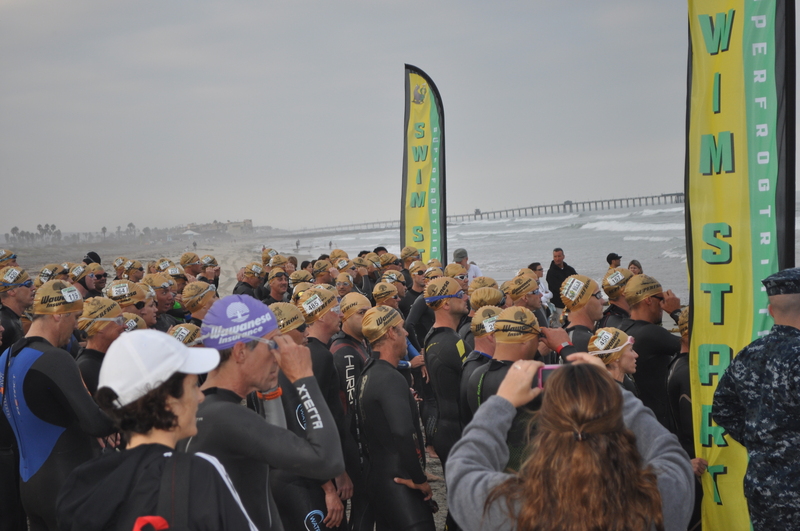 The SUPERFROG Triathlon was held on the Coronado training beaches of the Navy SEAL program and the event itself is rooted in SEAL tradition. Hall, who was awarded the Silver and Bronze Stars during his 21-year career as a SEAL, also said planning is now underway for the SUPERSEAL and SEAL SPRINT events in mid-March, 2012 and a tentative date for the next SUPERFROG Triathlon is Sept 29, 2012. The SUPERFROG organization’s goal is to raise $200,000 for the Navy SEAL Foundation between all three events. 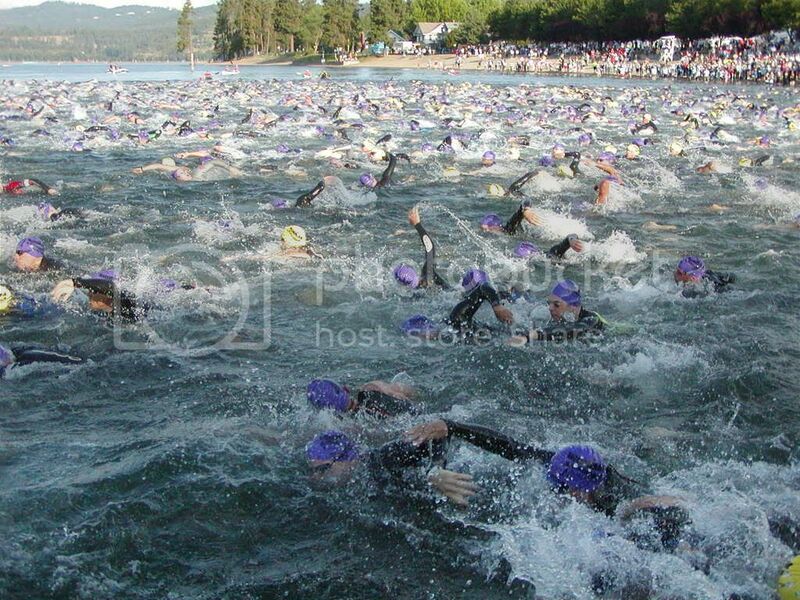 More information about SUPERFROG, SUPERSEAL and SEAL SPRINT can be found at http://www.superfrogtriathlon.com .